Ok, lets face it, most of us love pasta, at least I do!! !, but in this dish there is no trace of pasta. At the same time not every one in the home follows the same restrictions, making pasta this way gives the cook the right way to please everyone. This recipe ingredients are a list for one person, just get ready all the ingredients and Saute the final dish while your family is sit on the table, this will be fun specially on the little kids. 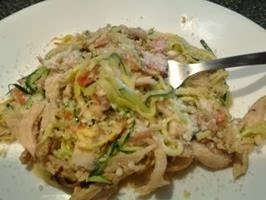 3/4 Cup Cooked Spaghetti/or/a mix of banana and zucchini squash julienne on their length side; imitating spaghetti. Heat a sauté pan and brush with olive oil, saute 1/4 the onion and garlic. After 1 minute add a bit more of olive oil, the carrots and green beans. Sauté until vegetables are almost tender, add some wine or stock to deglaze the pan, sprinkle some crushed peppers and fresh thyme. Quickly incorporate the spaghetti or the mix of banana and zucchini squash, julienne on their length side; imitating spaghetti. At the same time add a little of half &half (replace if wanted with: evaporated milk, cream, demiglace, stock or wine). Saute a bit to evaporate the liquid a little bit and add Parmesan cheese. When cooking spaghetti, always cook 1 lb, as long as you do not over cooked it, pasta is great to keep in your refrigerator. Drained and cool pasta in chilling cold water to stop the cooking process and drain again, toss with a little oil and keep in a airtight container in your fridge. Is a great thing to make something fast for that picky eater in your home while you might enjoy something different. To get a perfect julienne you can either use a mandolin, or a Julienne slicer peeler tool. And slice the squashes on their length side. Here is a link to a mandolin/slicer/grater ,one of my new favorite tools in my kitchen, there are many mandolins around, but I like this one because it sits flat on the counter, and under adult supervision your kids can easily help in the kitchen with little tasks, like making salad toppings and shredding cheese, etc.